Fortunately this a story has a happy ending and I am still a two-eyed pastor, but it was touch and go for a few weeks. It all started one afternoon in mid-November. I think it was a Wednesday. I was sitting at my desk at church, working on Sunday’s sermon, and noticed a shadow in the lower left corner of my right eye. I’ve got a few all-star floaters in that eye and sometimes my contacts get out of place, so I just rubbed it a little, and resumed what I was doing. But it was still there. Mostly when I looked up and to the right. Weird. About an hour later, it seemed a little larger, so I thought I’d give my eye doctor a call. “Come right over,” they said. It was just down the street, so a few minutes later I was there and Dr. Nunez was peering into my eye. He described a a horseshoe shaped tear in my retina, and it had begun to pull away. He used the sobering words “ocular emergency,” and called to see if he could get me in to the retina specialist. They were already done for the day, so my appointment was first thing the next morning. My wife took me down to my father-in-law’s house, and he took me down to the office in Daytona Beach. I only had to wait about two minutes before they called my name and took me back to dilate my eyes, do some scans and have Dr. Dunn take a look. 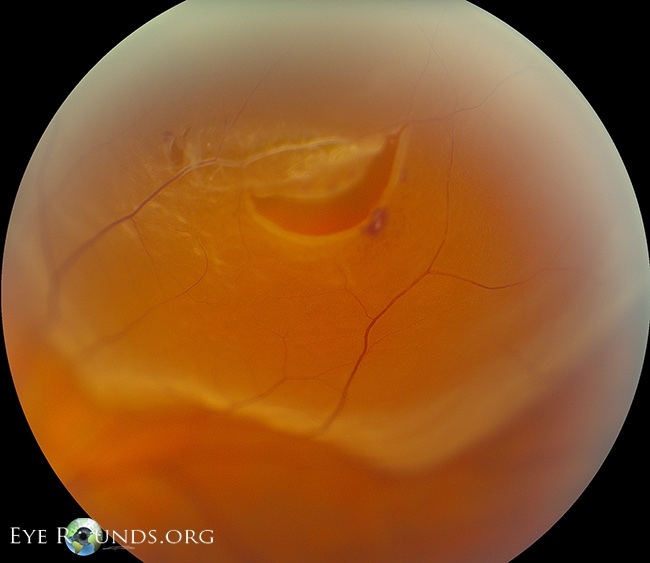 He confirmed the tear and retinal separation and decided to do a pneumatic retinopexy. This would involve numbing the eye, then freezing the tear, and finally injecting a gas bubble into of the eye to push the detached retina back into place. It all happened pretty quickly, with mild discomfort similar to an ice cream brain freeze. A few hours later, I was headed home. With a bandage covering my bad eye, I had to sit up all night and keep my head tilted to the left about 15 degrees so the the bubble would press ahead on the right area. For the time being, I was a one-eyed pastor, and I couldn’t help but think of one of my favorite tracks by Chuck Mangione’s Legend of the One Eyed Sailor. My follow up appointment was a week later, and I was disappointed to learn that once the bubble had shrunk, the retina had again become detached. So I had to get another freeze and bubble, but this time, I’d be back in a few days for some laser reinforcement. The laser experience was wild. First, they really numbed my eye, to the point where I couldn’t even open my eye. Then the doctor fired up the laser and I experienced hundreds of little flashes as he repaired the tear and then reinforced a perimeter around the tear. The procedure has about a ninety percent success rate. All I had to do was let it heal. A few weeks later, everything looked good, and I could resume normal activity. I could see with that eye, but my vision was lousy. Images were distorted and out of focus. Healing could take anywhere from three weeks to six months. I’d just have to be patient. A few months later, my vision is a little better, but I still have a way to go. I’ve seen my regular eye doctor, he said everything looked good, and he adjusted my prescription. I go back to the specialist in a few weeks for follow up. Why did it happen? Who knows? Since there was no trauma or diabetes to cause it, the doctor said it might have been due to my extreme nearsightedness. I’m thankful and amazed at what God and his doctors can do. This procedure sure beats scleral buckling surgery, which would have been next, had not my treatment worked. This entry was posted in Grace, Life and tagged detached retina. Bookmark the permalink. Wow! I just looked up scleral buckling! Good that healing is progressing without that procedure!